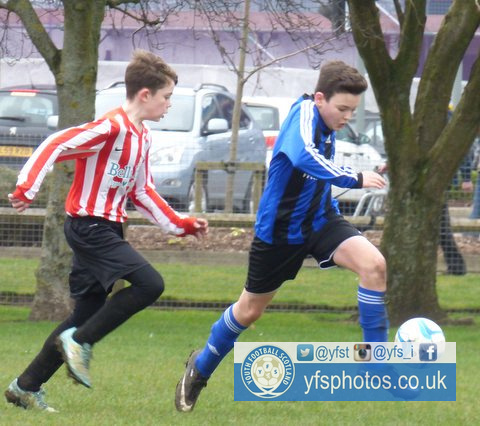 St Andrews Colts claimed a 4-1 victory in their J Clenaghan league fixture against Arbroath Community Sports Club. Ross Farquharson put the home side 1-0 up early on, before Steven Dell netted a penalty, which saw the two sides level at the half time break. St Andrews Colts then scored three times in the second half, courtesy of Ross Hazel, Jay Cameron and Josh Purdie, to secure the win. St Andrews Colts started the game well with the larger share of the possession. This showed in just the second minute of the match when they were able to translate their ball possession into a chance. Colin Wares attempted a looping shot at goal from several yards out but Jay Barber, in goal for Arbroath, was able to pluck it out of the sky before it could progress any further. Soon afterwards St Andrews scored the opening goal of the game. Wares, again, proved to be the catalyst when he fired a shot at goal that duly thundered off of the crossbar. With the defence scrambling Ross Farquharson displayed great alertness to latch onto the rebound first. He controlled the ball expertly before slotting the ball into the bottom left hand corner of the net. In the 15th minute it was Ross Hazel’s turn to have an attempt at goal. The St Andrews number 4 looked to curl in his effort but was denied by an outstanding save from Barber, who parried the ball away to safety. Shortly afterwards Arbroath had worked a great opportunity for themselves. Bradley Bell made a terrific run down the right wing, evading several challenges on his travels. He then looked to play in Lewis Milne, who was lurking unmarked in the penalty area. Bell’s cross, unfortunately, was played just behind the striker and Milne could not execute the shot that he wanted. As such the number 19 was only able to shoot the ball up high leaving goalkeeper, Corey Brunton, to claim the loose ball. As the game ticked into the 19th minute Jay Barber was called into action once more. Farquharson, in search of his second, unleashed a fierce low shot from inside the box but was denied when Barber parried the ball back out wide. Wares latched onto the rebound first but was only able to fire his shot into the side netting. A minute later Arbroath came incredibly close to equalizing through a direct free kick awarded about 30-35 yards out from goal. Steven Dell took the kick and the ball very nearly looped its way into the back of the net. Standing in the way of an Arbroath equalizer was Corey Brunton, who thrust up his right hand and managed to divert the ball onto the post. On the 25th minute Arbroath were given the break that they needed to get back on level terms when Norbert Wawer was penalized by the referee for hand ball in the area. Dell stepped up to take the penalty kick and successfully dispatched it into the bottom right hand corner. St Andrews very nearly responded in emphatic style two minutes later through Ross Hazel. The midfielder stepped up to take a free kick and looked to bend the ball into the bottom right hand corner. Unfortunately for him the ball went just the wrong side of the post. Five minutes before half time the woodwork came into play once again, this time denying St Andrews. Once again, Hazel came close as he looked to shoot across goal and into the bottom left hand corner of the net. This time, however, the ball ricocheted off of the post and the Arbroath defence successfully cleared the danger. The second half began in spectacular fashion as, less than a minute into the period, Ross Hazel put his side 2-1 up. Having come close to scoring several times in the first half Hazel put all those misses past him by netting a stunner. From an improbable range and angle he stepped up to take a free kick and succeeded in firing it towards the far post and in. Having gained the lead once more St Andrews were determined not to lose it for a second time. On the 46th minute they gave themselves a two-goal cushion when they netted their third goal of the match. Colin Wares successfully broke through the defense to find himself in a one on one situation against Barber. He aimed his shot to the right of the goalkeeper but Barber was able to stick out a strong hand to parry it away. Unfortunately for Arbroath the rebound fell to the feet of Jay Cameron who had followed in. The number 3 took his time to control before slotting the ball into the net, despite the oncoming defences best efforts. A minute afterwards Arbroath nearly clawed one goal back. Bradley Bell was the supplier from the right wing, once more, as he picked out Mitchell Bolton a few yards out from goal. The Arbroath number 20 succesfully diverted his shot towards goal but Corey Brunton successfully bundled the ball away. On the 52nd minute Lewis Scanlan made a fine run down the right side and was able to feed the ball to his teammate, Cameron, six yards out from goal. Unfortunately for Cameron, he couldn’t grab his second goal as he fired his shot over the crossbar. Five minutes later Farquharson managed to break free of the defence and found himself in a one v one situation with newly introduced Arbroath ‘keeper Hayden Menmuir. For someone who had just been introduced to the game Menmuir displayed no nerves. He ran out to tackle Farquharson and was able to successfully clear the danger. As the game ticked into the final minute St Andrews were able to break and grab themselves a fourth goal. Farquharson picked up the ball in a wide right position and was able to send in a cross that found its way to an unmarked Josh Purdie in the box. The St Andrews number 2 rifled his effort into the roof of the net to complete a great days work for St Andrews Colts. As the game concluded St Andrews Colts were left to reflect on a hugely positive performance with some great goals and some excellent all round play. For Arbroath CSC there is plenty to take from this game. They were the dominant side for a spell towards the end of the first half and there is plenty to suggest that, with a few minor tweaks, this team can go on to be a strong outfit. Steven Dell – Displayed some great composure on the ball and was his team’s set piece supremo. Came close to scoring with a free kick and expertly dispatched the penalty. Ross Hazel’s free kick – Has to be doesn’t it? After being denied by the woodwork and missing easier looking chances he then produces a goal like that. Great strike. Jay Barber’s save on 15 minutes – Great save to keep his team in the game. Also managed to parry it away to safety rather than just pushing it back out. Very good goalkeeping.